Mornings are supposed to be a time of refreshment where you shrug off sleep and rise to meet the day. It is therefore unhelpful when, instead of waking up ready to face the world, you find yourself held back by a pulsing, pounding, or stabbing pain in your head. Morning headaches can be disruptive and intensely unpleasant so it’s natural to want to find a cure. Unfortunately, headaches are not created equal and there are a number of different causes that can be behind your pain. By paying attention to the type of pain, its location, and other associated symptoms, you can better narrow down your exact affliction and properly treat it. Headaches come in all shapes and sizes from mild throbs to nausea-inducing agonies. Often, the symptoms can be used to indicate what the cause of the headache is. Although one of the most common headache types, tension headaches are not entirely understood. They present themselves with a dull, aching form of head pain and a feeling of tightness or pressure on the forehead, sides, or back of the head that is sometimes likened to being clamped in a vice. The scalp, neck, and shoulder muscles may also be tender. Tension headaches can sometimes be mistaken for migraines but it is possible to differentiate the two. Generally, a tension headache doesn’t come with nausea or sensitivity to light or sound and won’t be worsened by physical activity. Stress, depression, and anxiety are sometimes cited as causes of tension headaches but specific triggers have yet to be identified. Tension headaches tend to be worse during the morning hours. Being sleep deprived affects blood pressure, hormone production, anxiety, stress, and a host of other elements throughout your body. This little stew of discomfort can sometimes manifest as head pain. The morning headache caused by insomnia feels sore and strained and slightly heavy. It is a sign of weariness and pressure from not having enough time to recharge. Besides insomnia, most forms of sleep disorder or disturbance, including too much sleep, can lead to headaches. You have likely experienced at least one morning where you’ve woken up with a crick in your back or a sore muscle from sleeping in an awkward position. This is similar to what happens when your sleep posture leaves you with a morning headache—you have spent the night putting pressure and stress on part of your neck or shoulders and this can lead to you waking up with a sore skull. It is not too surprising that being unconscious for six to eight hours without food causes your blood sugar to drop. Among diabetics, this can lead to a hypoglycemic headache either during the night or upon rising. Some migraine sufferers find that hunger or low blood sugar can also bring on an episode, leaving them waking up in the middle of an attack. If you grind your teeth in your sleep, the vibrations will travel up your skeleton and affect your shoulders, neck, and head, often leading to morning headaches and a sore jaw. These are known to be among the most painful types of headaches and have a habit of waking you up in the middle of the night or early morning. The intense pain of a cluster headache—described as a sharp, penetrating burn—usually focuses around one eye but can radiate outwards to other areas of the face, neck, and shoulders. Sweaty, pale skin, a stuffed or runny nose on the same side of the face as the eye, and swelling of the eye are common symptoms. Attacks of cluster headaches can last up to twelve weeks and some occur seasonally. During this period, attacks can occur daily, often at night, and last anywhere from 15 minutes to three hours. Although there is no known cause of cluster headaches and they lack known triggers, drinking alcohol during episodes can trigger a splitting headache and complicate the problem. As you have likely noticed, morning headaches can have a number of different causes and all can be treated in different ways. Icy-hot patches are capable of penetrating the skin and relieving aches, making them ideal for treating morning headaches induced by posture, teeth grinding, or other musculoskeletal-related causes. Try using one either after getting up or while trying to return to sleep. Sometimes your headache can be eased by a good bowl of cereal, especially if hunger or blood sugar is the culprit. If you find yourself regularly experiencing hunger or blood sugar-related morning headaches, consider adjusting some of your evening eating habits. Pushing dinner back an hour or even having something small to eat (like that bowl of cereal) just before bed can keep your body sustained until morning. Hydration can also play into your headaches. 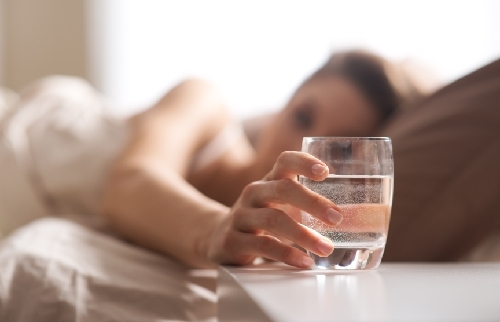 Although it is natural to want to avoid drinking anything before bed so you don’t have to use the bathroom during the night, consider a small glass or two of water to see if the extra liquid helps stave off the morning pain. Few people in the U.S. experience severe dehydration but even going without a drink for most of the day can cause mild symptoms like headaches when you wake up. Some headaches are characterized by having the blood vessels in the head dilate. Cold temperatures have a vasoconstrictive effect—they cause blood vessels to narrow. Start with a warm shower and gradually lower the temperature so your body can stay comfortable; allow the temperature to narrow the blood vessels and ease the symptoms. While physical exertion may be the last thing you want to do when dealing with a headache, it can be helpful. Exercise makes your brain release signals that lessen your pain response and allows you to be more comfortable. As a bonus, exercise also improves the quality of your sleep and can help you maintain a proper sleep schedule. Since sudden, intense exertions can aggravate even non-migraine headaches, it is best to start slowly with something like walking or light biking and then work your way up. You can’t help how you move when you’re asleep but you can control what position you fall asleep in. Try keeping your body aligned and use a comfortable pillow that can help keep your head and neck in a neutral position to avoid strain. If you find yourself regularly cold at night, also consider an extra blanket, thicker sleep shirt, or other methods to stay warm. Low temperatures can increase tension in the head and neck while you sleep. You experience a sudden, severe headache out of proportion to others you have felt. “Why You’re Waking up with Headaches,” Sleep.org; https://sleep.org/articles/waking-up-with-headache/, last accessed January 14, 2016. “Waking Up with Headache,” Med-Health.net; http://www.med-health.net/Waking-Up-With-Headache.html, last accessed January 14, 2016.